Peak oil refers to the moment that the peak of oil extraction, in barrils per day - worldwide, is reached. End of oil is likely to coincide with the end of natural gas. Some specialists predict that this will happen within the next couple of years. Others think that it won't be before the end of this century, or even beyond. The precautionary principle - better safe than sorry - suggests that we act as if the end of oil is happening very soon and that we take the necessary measures. Coal, hoever, can not replace oil or gas. If the present trends continue unchanged, we will run out of liquid and gaseous fossil fuel before long. 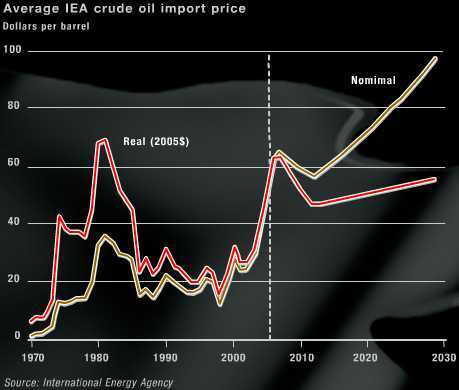 The latest Outlook of the IEA (International Energy Agency) presents a gloomy picture. Here are some key quotes. "The world is facing twin energy-related threats: That of not having adequate and secure supplies of energy at affordable prices and that of environmental harm caused by consuming too much of it." "If we continue as before, the energy supply to meet the needs of the world economy over the next 25 years is too vulnerable to failure arising from under-investment, environmental catastrophe or sudden supply interruption." "Current trends in energy consumption are neither secure nor sustainable - economically, environmentally or socially." "The longer prices remain at current levels or the more they rise, the greater the threat to economic growth in importing countries. " "Those most vulnerable to higher energy prices are heavy manufacturing industry, including aluminium, petrochemicals and iron and steel, and freight. " "Real oil ad gas prices are assumed to remain high in 2006 and 2007 and then to fall back gradually over the next five years or so, before resuming a modestly rising trajectory through to 2030." "The single most important area of policy action is energy pricing. Many developing countries, especially in Asia and Africa, continue to subsidise implicitly or explicitly the consumption of energy services." "The world’s remaining economically exploitable fossil-fuel, hydroelectric and uranium resources are adequate. At issue remains whether these resources will actually be developed quickly enough and at what cost. " "The largest increases in nuclear power generating capacity are expected in China, the US, Japan, the Republic of Korea, India and Russia." 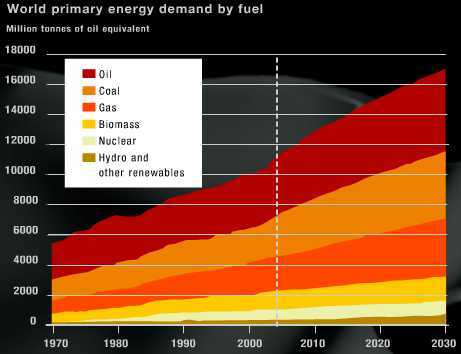 "Rising food demand, which competes with biofuel for existing arable and pasture land, will constrain the potential for biofuels production using current technology"
"Coal is the most abundant fossil fuel. Proven reserves at the end of 2005 amount to around 909bn tonnes, equivalent to 155 years at current production rates. (BP, 2006)"
"Non-Opec production of conventional crude oil and natural gas liquids is set to peak within a decade... The concentration of oil production in a small group pf countries with large reserves - notably the Middle East Opec members and Russia - will increase their market dominance and their ability to impose higher prices." "Growing oil exports from the Middle East will focus attention on the world’s vulnerability to oil- supply disruptions, not least because the bulk of the additional exports will involve transport along maritime routes susceptible to piracy, terrorist attacks, or accidents." "The willingness and ability of national oil companies to develop reserves are in many cases very uncertain." "Expressed in cost inflation-adjusted terms, investment in 2005 was only 5 per cent above that in 2000." "Since 2002, drilling-rig rates have risen more than any other cost component, with daily rates increasing as much as 100 per cent for a North Sea jack-up rig to over 400 per cent for a rig in the Gulf of Mexico." "Increasing exploration and development activity is stretching the industry labour force to its limits." "Another source of uncertainty concerns the possibility of major gas exporting countries coordinating their investment and production plans in order to avoid surplus capacity and to keep gas prices up. " "There are doubts, for example, about whether investment in Russia’s gas industry will be sufficient even to maintain current export levels and to start exporting to Asia." "Developing countries account for over three-quarters if the increase in global CO2 emissions between 2004 and 2030 [if current energy trends continue]." "Expectations about stricter CO2-emission regulations favour gas rather than coal. This trend is expected to change gradually, in favour of coal, as concerns grow over the security of gas supply." 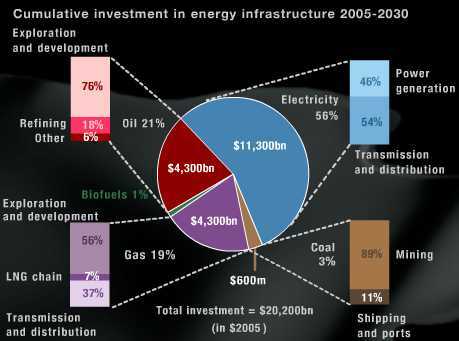 "On average, oil-importing developing countries use twice as much energy to produce a dollar of output as OECD countries. " "There are still 1.6bn people in the world without electricity. On present policies, that number would fall by only 200m by 2030. With less than 7 per cent of their population having access to electricity, Burkina Faso, Mozambique, the Democratic Republic of the Congo and Afghanistan are the least electrified countries in the world." ecoglobe believes that many outlooks are overly optimistic and don't consider other environmental circumstances. The combined effects of food, space, water and energy scarcities, and the coming weather extremes caused by climate change could lead to a break-down of present societal structures. Furthermore, we are convinced that environmental problems cannot be solved by means of technology (=investments), which requires again more non-renewable resources and produces more greenhouse gases and pollution. We must restructure, relocalise, slow-down and reduce dramatically, in all areas of life, including population sizes. Helmut Lubbers 7 November 2006.